At Panel Built, we push to constantly improve our company and work processes in order to better serve our customers. Beyond just the manufacturing aspect, we are continually trying to find new ways for all departments complete their procedures as efficiently as possible, in regards to time, materials, equipment, space, and effort. We do our best to instill this mindset in all of us here at Panel Built, challenging employees to think critically about improving their work processes and quality of our product as a whole. This is a process known as Kaizen, “Kai” meaning “change,” and “Zen” meaning “good.” It is one of the main focus points of lean manufacturing. Over the course of Panel Built’s Kaizen program, hundreds of kaizen forms have been turned in, in an effort to improve Panel Built’s safety, efficiency, speed, quality, and/or accuracy. These areas are the main focus of the program because they are the best ways to overall reduce “The 7 Wastes” of production: Transportation, Motion, Overproduction, Inventory, Waiting, Over-Processing, and Defects. Here are a couple of examples of some great new ideas being implemented. 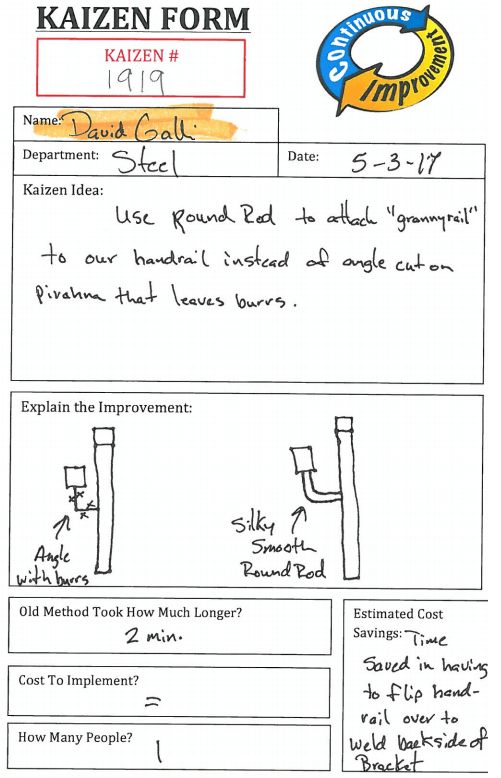 First, we have Mike Davis’s Kaizen from the Steel department. 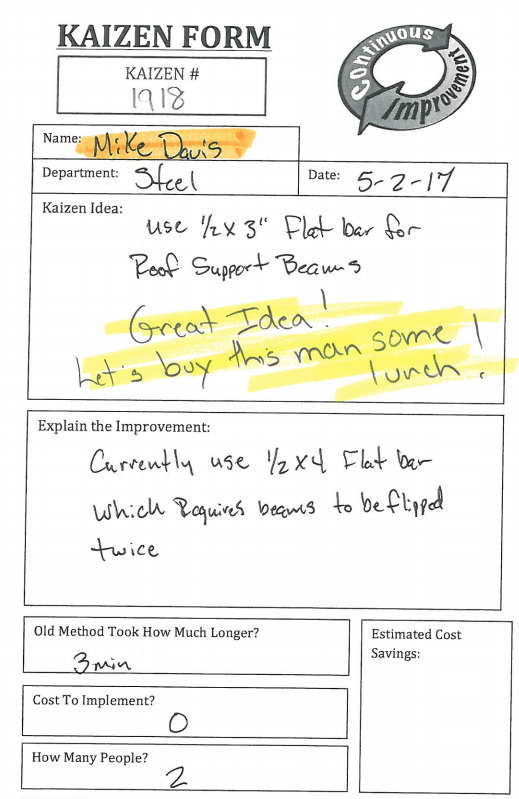 Mike kaizen idea is to use 1/2×3” flat bar for roof support beams, instead of the 1/2×4” flat bar that we currently use. The current 1/2×4” flat bar requires beams to be flipped twice. This change to our work process is projected to take up 3 fewer minutes that the previous method that was in place. Those minutes stack up to a lot after a while. This kaizen looks to improve the steel line’s efficiency, speed, quality, and accuracy. Great idea Mike! Second, and also from the Steel line, David Galli sent in Kaizen #1919. Galli’s kaizen is to “use round rod to attach ‘grannyrail’ to our handrail instead of the angle cut on piranha that leaves burrs.” The kaizen looks to provide “time saved in having to flip handrail over to weld backside of the bracket,” and time savings of around 2 minutes for each time used. The removal of the burrs from the rod will also provide a boost to safety and product quality. Nice work Galli!